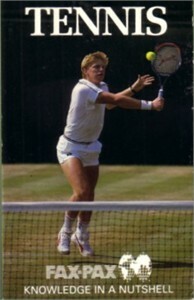 Complete set of 38 1987 Fax-Pax men's and women's tennis cards in original box, including many Rookie Cards. Among the notable players: Boris Becker, Guillermo Vilas, Jimmy Connors, Yannick Noah, Pat Cash, Chris Evert, Steffi Graf, Ivan Lendl, Stefan Edberg, Mats Wilander, John McEnroe, Martina Navratilova and Gabriela Sabatini. Also includes stadium cards for each of the four Grand Slam events.